You’d have to be a member of the undead to not know that the movie version of Twilight, Stephenie Meyer’s juggernaut book series about lost boys and the girls who love them, opens nationwide today. But you may not know that scads of Portland locals worked on and acted in the film, which was filmed in various Oregon and Washington locales earlier this year. They celebrated their collective achievement Thursday night at an exclusive party hosted by local casting director Lana Veenker. Custom cocktails were consumed (the non-alcoholic “Edward’s Tears” was a favorite among the youth set) and stories were swapped. At a midnight screening the crew and its biggest fangs –-er, fans-–bit into Hollywood’s made-in-Oregon ode to vampires. 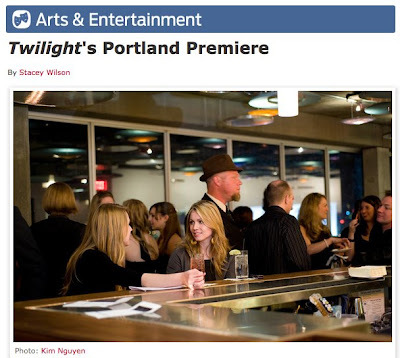 KATU’s Cover Story: The NW Premiere of "Twilight"